We work hard to make sure your ActBlue account’s security stands the test of time, but we know that mobile devices often do not! Since two-factor authentication (2FA) depends on your mobile device, you will need to update your account’s security settings whenever you change devices. Here’s how to switch your two-factor device and keep your account safe. Head to the My account tab under the User menu in the upper right-hand corner. Click on the “Security” link near the bottom. 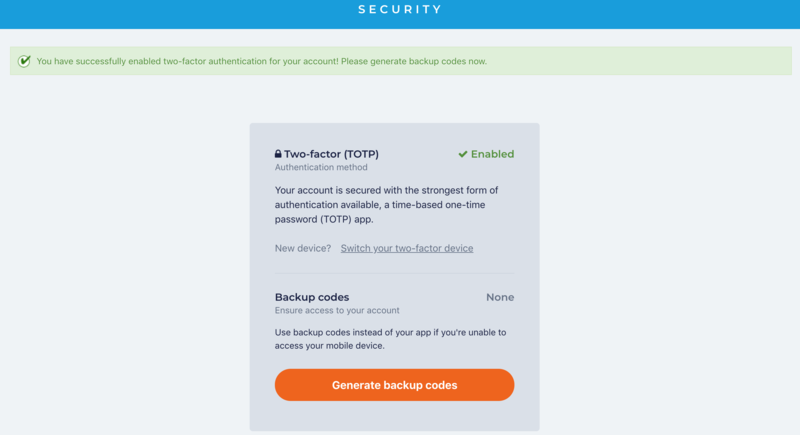 You’ll be brought to the Security page, where you can see whether you’ve turned on 2FA, enabled a Time-based One-Time password (TOTP) app, and generated backup codes for your account. Click on the “Switch your two-factor device” link under your account’s two-factor information. 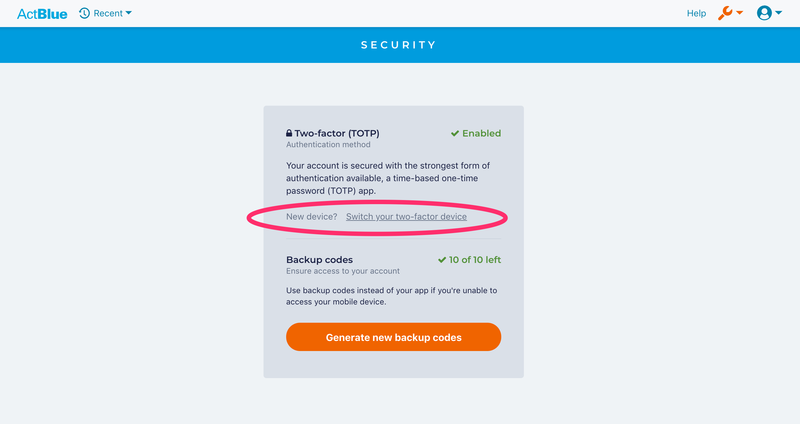 Before adding a new two-factor device, you will be asked to enter an authentication code from your current device or a backup code to verify your identity. After confirming your identity, your current two-factor device will be removed so you can set up a new device! You should also receive an email from ActBlue Security Alerts at support@actblue.com that confirms you removed your two-factor device. 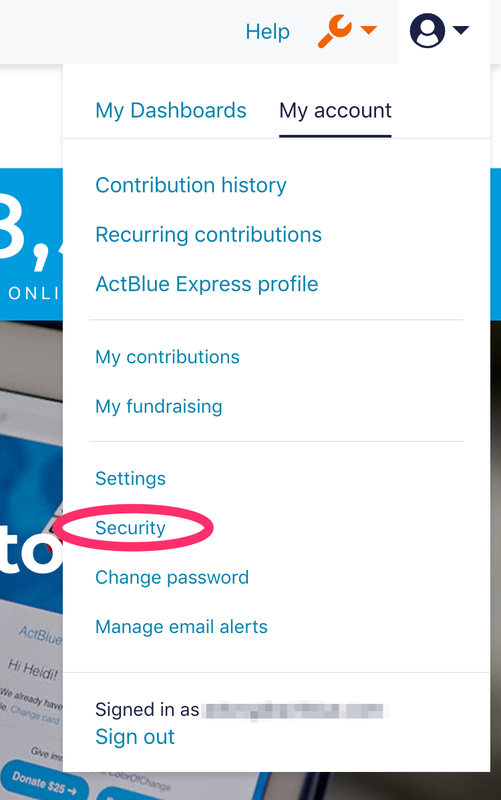 To keep your account secure, ActBlue Security Alerts will send you email notifications whenever changes are made to your account’s 2FA settings. Follow the three steps on the Security page to set up your new two-factor device. 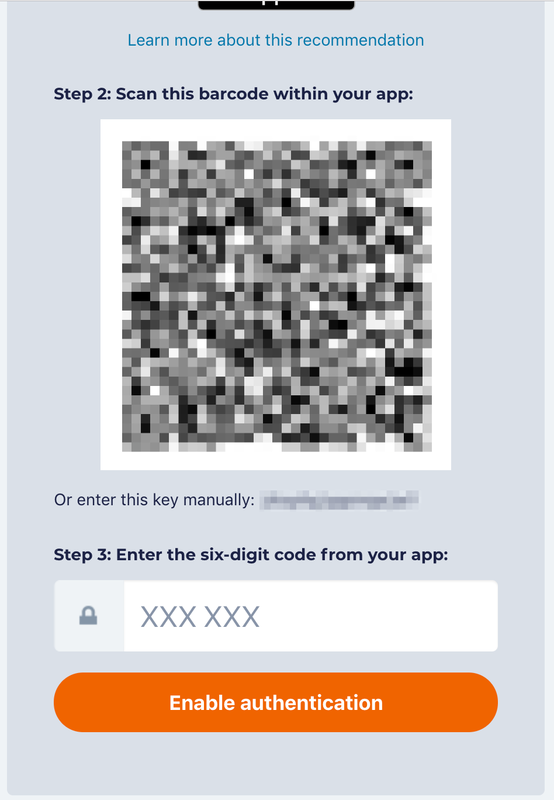 First download an app on your new phone or tablet that will generate authentication codes. 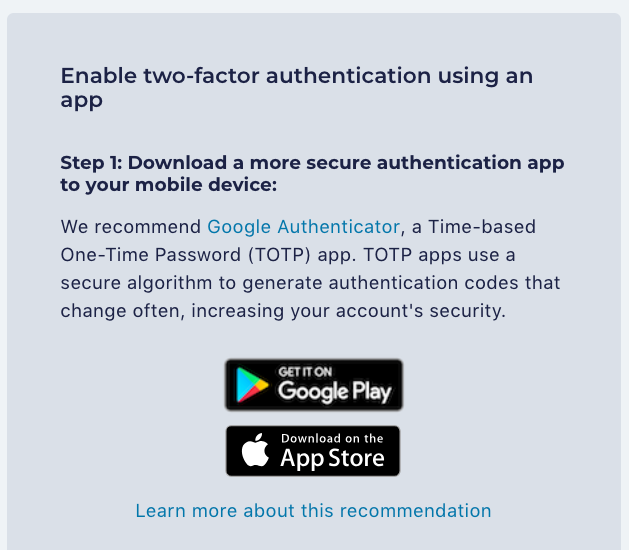 We highly recommend downloading Google Authenticator, which is a TOTP app that significantly upgrades your account’s security by using algorithms to generate codes. Open the app and scan the barcode under “Step 2” on our page. You’ll receive an authentication code from the app on your mobile device, which you should enter in the box under “Step 3” on our page. After entering the code, click the orange button at the bottom of the page to complete the setup process. 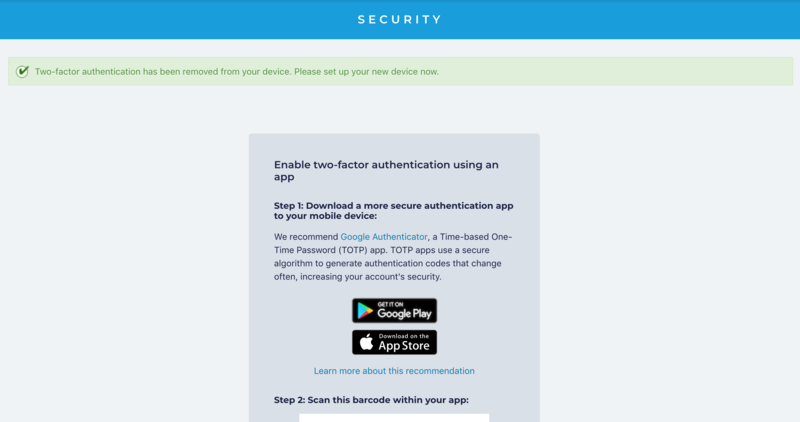 Now you can use your new device for 2FA when logging into your ActBlue account! After you’ve successfully switched your new two-factor device, you’ll see a green message at the top of the Security page confirming that you successfully enabled 2FA for your new device. You should expect another email from ActBlue Security Alerts verifying that you enabled 2FA. 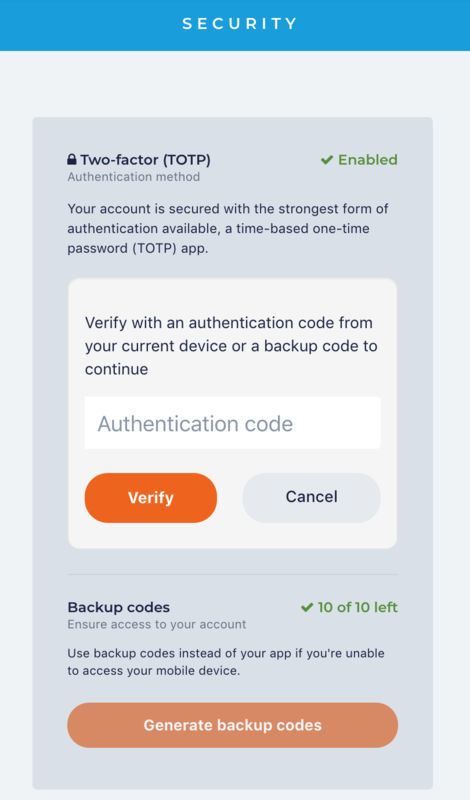 Because you just enabled 2FA for your new device, you should generate backup codes that can be used for logging into your account when you cannot access your mobile device. To receive backup codes, click the orange “Generate backup codes” button on the Security page. Then save these backup codes in a secure password manager like 1Password for safekeeping. You should expect a final email from ActBlue Security Alerts confirming that you generated backup codes. If you have any questions, drop us a line at support@actblue.com! © Copyright 2006 - 2019 ActBlue.